A sea stack on Flowerpot Island located along the shores of Lake Huron in Fathom Five National Marine Park in Ontario, Canada has been uniquely shaped by the movement of the water. 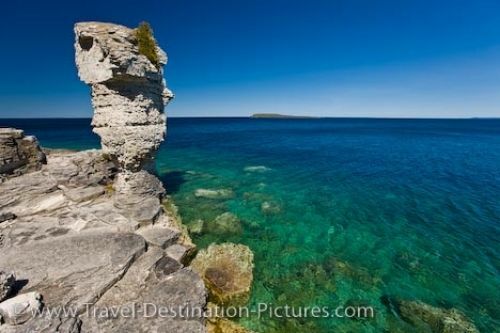 Flowerpot Island in Fathom Five National Park in Ontario, Canada was once home to three sea stacks but from the continuous movement of Lake Huron, one of the limestone formations broke in 1903. Of the two remaining sea stacks, one stands at 23 feet high while the other one reaches 39 feet. This sea stack, resembling that of a flowerpot, has a small growth of greenery sprouting from the top where it overlooks the stunning hues of the shoreline of Lake Huron. The water continuously eats away at the base of the sea stack making the erosion more noticeable year after year. Visitors to Fathom Five National Marine Park can book a boat tour to Flowerpot Island, leaving daily from May through to October. Picture of Flowerpot Island where a sea stack stands on the shore of Lake Huron in Fathom Five National Marine Park in Ontario.